4.1 / 5 Score from 28 reviews. Location: Snowplough apartments are located on a quiet street at 15 minutes walking distance from the Gondola ski lift in Bansko resprt. The centre of the resort is situated at 5 minutes walking distance from the hotel. Accommodation: The property features 18 self-catering one-bedroom, two-bedroom apartments and maisonettes. 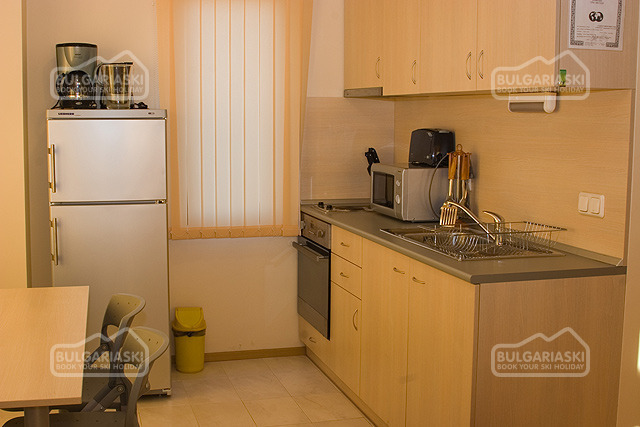 The apartments are comfortably furnished and equipped with cable TV, cooking facilities, bathroom with shower cabin. In the two-bedroom apartments can be accommodated 4 adults in the bedroom and 1 child on the folding sofa at the living room. Maximum occupancy in the one-bedroom apartments is 2 adults and 2 children. I have stayed here for 4 days in February 2009 and I must say that I was very impressed. At a very affordable price I have received a clean and spacious apartment, room service, and free transport to the gondola lift, which is much more then I bargained for. As for the resort, it has everything you need, plenty of restaurant and shops, you cannot get bored. Sky conditions were great and although there were some problems with the gondola lift one day, the people there sorted it very fast with free buses. I cannot wait to get back in Bansko. 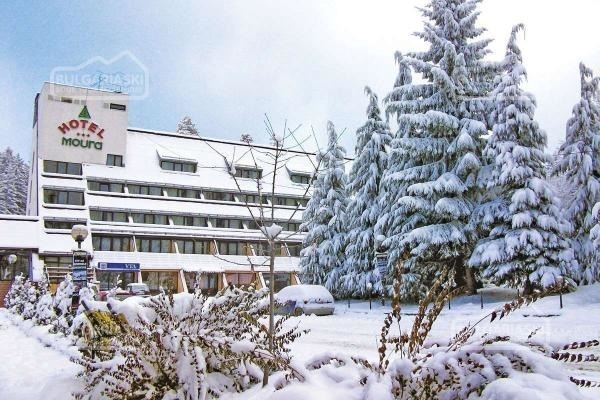 Please, post a comment on Snowplough Apartments, Bansko. * All prices are in Euro per apartment per night, no meal included. * Cancellations can be made, providing details of this are received at least 14 working days prior to check-in day - cancellations made after this period will incur a fee equivalent to the cost of the 3 nights of the accommodation and catering! Cancellations for the period 28 December - 03 January can be made min. 31 days before the check in date and cancellations made after this period will incur a fee equivalent to full amount for the accommodation! Ñïîêîéíûé òèõèé îòåëü.íè÷åãî íå íàïðÿãàëî. ß î÷åíü äîâîëåí îòåëåì è ïåðñîíàëîì. Äàëåêîâàòî äî ïîäú¸ìíèêà ïðèìåðíî 18ìèíóò ñâîáîäíîãî õîäà íî ýòî äàæå õîðîøî. Ìîðå ïîñóäû è ýëåêòðîïðèáîðîâ. I enjoyed a lot vacation in Bansko, I consider the apartment we stayed is much cheaper than we paid but we understood that it was during high season, thank you. After severel years of hard usage owner has to replace beds with new one! That investment will secure in future full occupation of apartment and adequate customer satisfaction. I want to come next year too! It was very beautiful. In Bansko is hard to find an address (for ex. the accommodation) because I don't saw the street names and neither the building numbers. Otherwise, the town have a pleasant and unitary architecture (with the mention that the buildings are too closed) and the ski slopes are ok compare with Austria. For a Romanian tourist, from ski and accommodation conditions-distance-price point of view is better then Austria, Italy, France. We booked a room for 6 people that barely slept 4. How two people were supposed to sleep on that sofa bed was beyond me, we were all grown men, not 5year olds! There was no hotel staff and the cleaners were the most horrible and unfriendly people there. A smile and a good morning isn't too much to ask is it? I enjoyed the skiing and eating out but that had nothing to do with where I stayed. Many thank's to Marina Blazheva for the help provided in making the reservation and giving all the details we asked for. Cheap as chips, friendly and fun. Great place to check out kick back plus your bound to run into some loose random bulgarians to keep the laughs up. Snow wasn`t bad either plenty of it but not as pow as the alps. Well worth it if your on a budget!!! All was perfect, congratulations, i will come soon with pleasure.